London, UK—With Millennials and Gen-Z now accounting for two-thirds of all diamonds sold worldwide, the bridal market should be burgeoning. But the U.S. bridal jewelry market has dropped off significantly from its peak, despite the vast number of young consumers. In the mid-1980s, 80% of all U.S. brides received a diamond; today, that figure is down to 70%--and more than half of the total decline has occurred in the last five years. That’s the bad news. 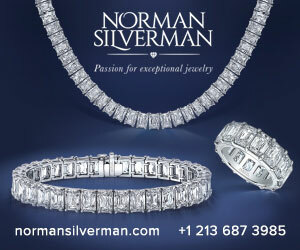 The good news is a myriad of other opportunities to sell diamonds. Many formerly-negligible markets—such as mother-daughter—have grown to be quite substantial. The number of U.S. brides receiving a diamond engagement ring (blue line) peaked in the late 1980s before dropping 10 percentage points through 2017. All charts, De Beers. Bridal and romance. 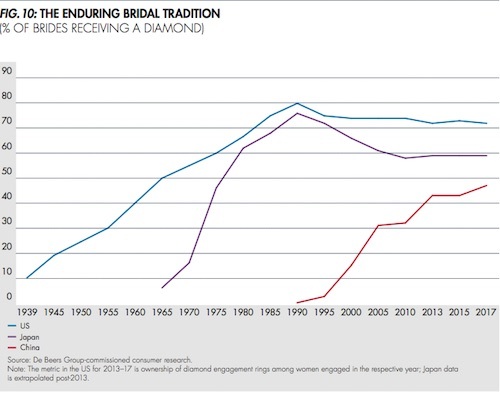 The traditional bridal segment represents 27% of diamond sales by value in the main diamond-consuming countries (United States, China, and Japan). But while the bridal category’s share of total U.S. diamond demand has been falling over the past five years, that decline comes amid an overall increase in diamond consumption and growth in non-bridal categories. 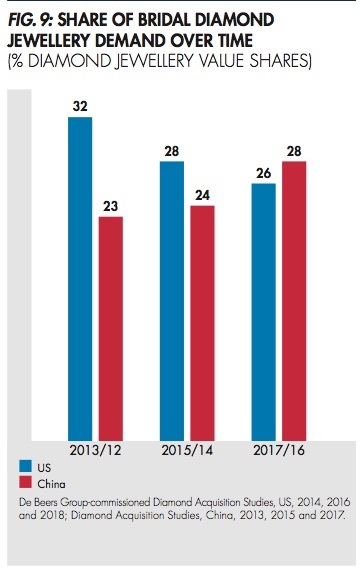 In the United States (blue bars), bridal jewelry has dropped from 32% of the total diamond jewelry market to 26% in the past five years. Millennials and Gen-Z are not hermits. The majority still want a committed relationship, and many still harbor romantic visions of love, engagements, and weddings, with a strong affinity for the traditional commitment symbol a diamond represents. The difference is that while having a relationship is important, marriage is less so. 80% of Gen-Z hope to be in some sort of committed relationship by their early 30s, but only half of those expect to be married with children; i.e. experiencing that life event the same way their parents did. What does that mean for retail jewelers? In a word, broaden your view of relationships. “The young generations’ liberal attitudes towards sexuality and gender identity require businesses in the diamond industry to move beyond binary approaches to these issues,” says De Beers, adding that it’s essential for jewelers to avoid gender stereotypes and venture out of traditional relationship contexts. What hasn’t changed is the importance those consumers place on romantic gestures from their partners. The main proposition of a diamond as a symbol of commitment and love—and the opportunity to sell one as such—remains as relevant as ever. 58% of Americans age 18-34 feel it’s “very important” for their partner to make a romantic effort. Their attitudes show a core of traditional emotional needs and expectations, centering on the celebration of lasting love and commitment, although not necessarily a wedding. For instance, one De Beers respondent defined romance as a homemade dinner, cuddling and doing something nice for their partner, whereas another defined it simply as going out of your way to do something special for a partner. “Doing for” the partner remained constant. Personal, informal, and responsible. Both Millennials and Gen-Z seek to create meaningful moments with objects that have personal meaning, inspiration, and expression. A high priority is to keep things informal and relaxed in a socially responsible way—something the diamond industry has not addressed so well in the past, says De Beers. These consumers are looking to create magic and delight not only for the bride but for all involved in the event, in a unique, edgy, and socially responsible way. “The diamond industry has an important opportunity to engage Millennials and Gen-Z on bridal occasions by helping them to appreciate the uniqueness of every diamond and further to design unusual, creative and unique diamond symbols of their love and bond, while in the process also creating special experiences,” says De Beers. Diamonds remain the most desired precious gem gift among both Millennials and Gen-Z. 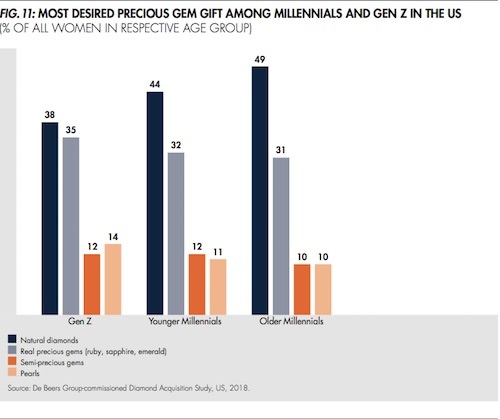 Among older Millennials, diamonds over-indexed by 18 points, but jewelers will be wise to keep an eye on the Gen-Z cohort, where diamonds surpassed other precious gems by only three points as a most desired precious gem gift. Brands and halos reign. In the United States, the two most popular engagement ring styles are both multi-stone settings in white gold: either a center stone with smaller accent diamonds, or a halo setting. Silver is used for a surprising 19% of engagement rings—more than yellow gold (14%) or rose gold (13%). More than two-thirds (67%) of U.S. engagement rings are branded. 35% of all engagement rings sold in the United States contain a largest stone of one carat or more, and 57% have a total diamond weight of more than one carat. Round diamonds don’t dominate the U.S. bridal market quite to the degree they once did, but they’re still the number-one shape, chosen by slightly over half (56%) of all American brides. 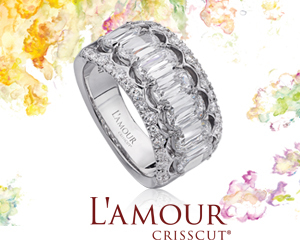 22% of American brides choose princess cuts and now 11% are opting for cushion cuts. Non-engagement love gifting. This is the critical part of the market that jewelers need to address, says De Beers. Over half of older U.S. Millennials first acquired a diamond through love—still usually an engagement ring—but sometimes it had no connection to a relationship milestone. 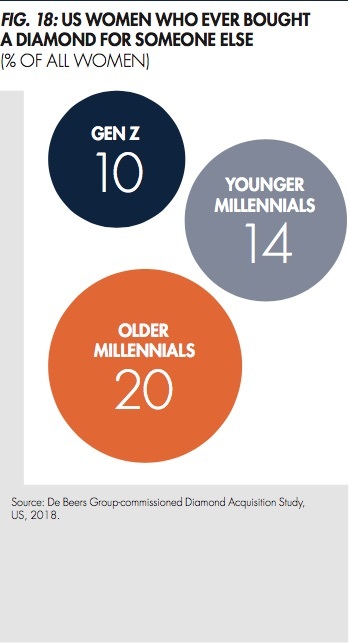 Younger Millennials and Gen-Z are likely to follow suit. 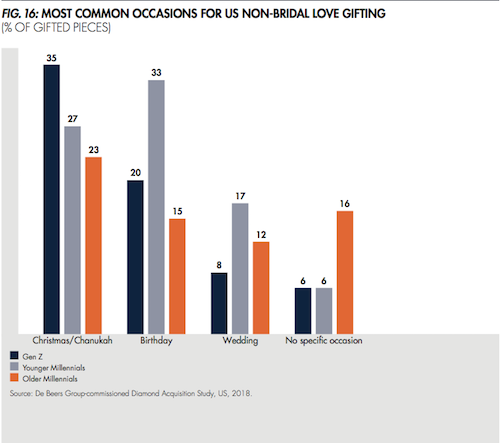 Non-bridal diamond jewelry love gifting accounted for 26% of the total diamond jewelry market by value in 2017—a not-insignificant percentage—and within that segment, nearly half the value was driven by Millennials and Gen-Z. The occasion might (or not) be related to bridal, but the jewelry piece wasn’t necessarily traditional and the giver of that gift might not be a partner. Indeed, American mothers are highly involved in the celebration of romantic milestones, especially of younger women. Women ages 18-20 are just as likely to receive diamonds from their mothers as from partners for holidays and non-bridal life milestones. 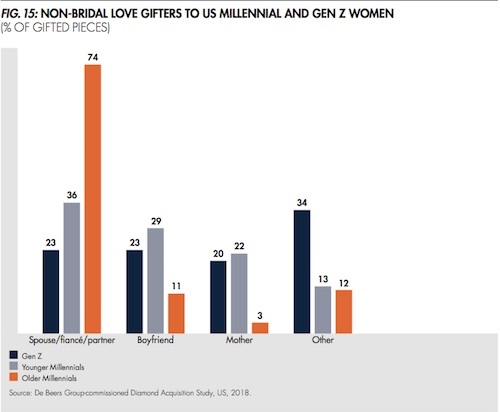 Likewise, Gen-Z and younger Millennial women are more likely to buy diamond gifts for their mothers, grandmothers, sisters, and close friends. One in five older U.S. Millennial women have bought diamonds as a gift, and one in 10 American Gen-Z women have. Overall, De Beers’ research points to one key conclusion: love and diamonds remain intertwined, but the needs and desires of younger consumers are complex. Understanding them and expanding focus beyond the traditional diamond-gifting moments will unlock a wide range of diamond sales opportunities.